Today I have a beautiful snowy poinsettia card for you! Other Products: Champagne Glitter Glass, Distress crackle Paint - Clear Rock Candy, VersaMark, Wow Primary Red Embossing Powder, Heat Gun, White Pearl Metallic cardstock, Green Metallic cardstock, SU Real Red cardstock, Sparkle Sheer Shimmer Spritz. Instructions: Create a 6” x 6” card base. 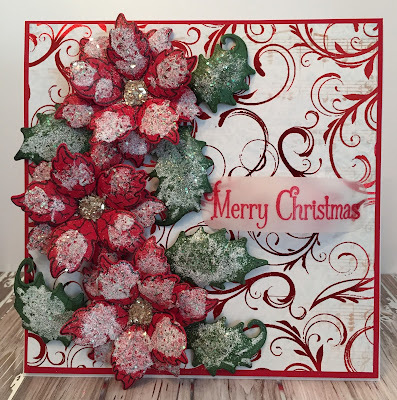 Cut two 5 7/8” x 5 7/8” Real Red mats and two 5 3/4” x 5 3/4” pieces from the Foil paper in the Festive Holly Collection. (Note: I love, love love this paper.) Glue the foil papers to the red mats and adhere one set to the front of the card base with dimensional tape and glue the other set to the inside of the card. Stamp the Sparkling Poinsettias with Tuxedo Black ink on red cardstock and shape using the Deluxe Flower Shaping Kit. Glue two of the flowers together and add the glitter glass to the centers. Create three medium size poinsettias. Stamp the leaves from the Large Poinsettia stamp set on green cardstock and shape them. Spray the leaves and flowers with Sparkle Sheer Shimmer Spritz. When they dry, paint the flower petals and leaves with Distress Crackle Paint-Clear Rock Candy or Dries Clear Adhesive, sprinkle with Rajni Chawla's Frosting Powder and dry with the heat gun to create “snow”. Adhere the poinsettias and leaves to the card base as shown. Stamp the sentiment on vellum using Versamark and heat emboss using Wow Primary Red embossing powder. Cut the vellum using the Cut Mat Create die, shape and adhere to the card base with glue. Thank you for stopping by and I would love it if you would leave me a comment. Wow, this is gorgeous! Don't you just love poinsettias? Thank you Glenda! Yes, I absolutely love poinsettias! I love this card! So pretty! That foiled paper with your poinsettias is beautiful! Love your card! Beautiful - the red poinsettias really set of the beautiful paper. love that you used that foil paper for your background.